Suspecting your mate of having an affair can be a very emotionally overwhelming experience. To be sure of anything you need facts. FIDA (First Indian Detective Agency) Services will investigate the suspicious activity, helping you attain the truth you need to make important decisions in your life. Feelings of disappointment, anger, uncertainty, betrayal and confusion can cloud rational thinking. There is no reason to live a moment longer wondering and in pain. If you are facing having to deal with FIDA then it can facilitate an in-depth, discreet investigation to find out for certain. With knowing the truth, comes peace of mind and in situations like these, certainty is priceless. Look over the list below, if this sounds even remotely familiar, you need to call FIDA today. There is nothing worse then the feeling of suspicion of a loved one, and until you know for sure, such thoughts could take a serious toll on your own relationship. Post matrimonial investigations services by FIDA include documentation of all places visited and identification of all people met by the spouse besides also the provision of video and photos of them and we are having the best Post Matrimonial Detective Agency. Our report may include a video documentation to support the investigation results also. Our Post matrimonial investigation services also encompass presentation of evidence and testifying in a court if required when the doubts and charges are proved true and infidelity is confirmed. If you are married and you suspect your significant other, someone confirming the affair is not enough. You will need documentation that can be taken to trial if you make the decision to divorce. Documentation is the most important part of your case. Having a thorough report, an explanation of video, and still photography evidence can help you with your presentation of the facts. If you decide to work with a lawyer, it is important to have the evidence FIDA provide to ensure your case and to protect you and your interests. All evidence is collected and provided in a strict, factual and specific manner. 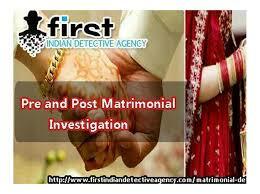 Extramarital affairs often lead to divorce FIDA Detectives are here to help. Our Services can assist in items from the discovery process to the healing process of recovering from infidelity. We believe infidelity is a very serious matter and should be treated accordingly. As difficult as it may be to come to terms with, you are going to need to get the facts and protect your interests. Coping with infidelity is not easy, but living with it is worse.